During a star-studded evening complete with a Red-Carpet entry at the Newseum in Washington, D.C., Comcast formally announced the addition of two television networks that highlight the company’s commitment to diversity. “African Americans have stories to tell and we’re not monolithic people; we come from different backgrounds,” said Michelle Rice, the general manager at Cleo TV. 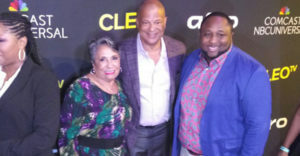 “I’m excited that this is by us, for us and there’s going to be a lot of great content that reflects our lifestyle,” said Rice, who joined cast members from various Cleo TV shows, executives from Comcast Afro and others in celebrating the launch of the new channels at the Newseum on Thursday, March 14. “Afro celebrates the richness and diversity of the Black culture with original and exclusive content. It is important to recognize that the African American community is not a homogeneous group. … They are Afro Caribbean’s, Africans or Afro Hispanos who are young, educated, greatly underserved and represent substantial long-term revenue growth opportunities,” Bollanga said. After evaluating more than 50 proposals, Comcast said in choosing Cleo and Afro that its main criteria were the content of the network; whether the network was fully financed; and whether the network’s ownership and/or management group(s) are well established, have relevant experience, and are substantially owned by African Americans.